The CF Motorsport Pacedayz.com Yamaha squad left the most recent round of the British Supersport championship at Assen last weekend with 5th and 6th places after the annual overseas trip saw them finish off the podium for the first time in 2015, despite mixing it at the sharp end once again. 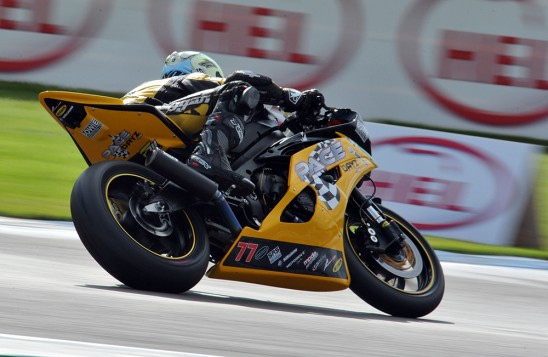 Whilst the results may not have provided any trophies, their sole British Supersport contender Kyle Ryde was in the mix throughout narrowly missing out on 2nd position in the opening ‘sprint’ race after being part of a thrilling 5 rider battle. Sunday’s ‘feature’ race saw the youngster start from second on the grid following his impressive pace in the opening encounter but a set-up change to cope with the change in conditions saw him finish only 6th, with Ryde getting the better of a trio of riders in his own personal on track fight. With a 98 point deficit to current championship leader Luke Stapleford, the immediate focus as the championship heads to Silverstone for the penultimate round next weekend is to consolidate 2nd overall in the series. As it stands Kyle and the team sit 14 points ahead of Jake Dixon, currently in 3rd place, and a further 7 ahead of Glenn Irwin who is 4th.